Celebrities holiday spots are no longer a secret. Here’s where to find Jennifer Anniston, Jay-Z and Beyonce, Cameron Diaz and other A-list celebrities on their beach holiday. Through all the break-ups, career highs and lows and unrelenting tabloid attention, one thing never changes for Jennifer Aniston: her favourite vacation spot, Cabo San Lucas, Mexico. 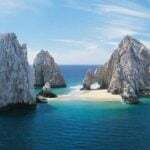 She favours the beaches of the sunny city—located at the southern tip of Baja, California—for birthday and holiday celebrations, often bringing along a crew of gal pals including Courtney Cox Arquette, Chelsea Handler and Sheryl Crow. Click here to find Cabo San Lucas on our interactive map showing you all the nearest attractions and accommodation. The South Beach neighbourhood of Miami Beach draws thousands of tourists each year (and is home to some of music’s finest, Gloria Estefan and Enrique Eglesias are just two stars who call the city home). Some celebs can be seen frolicking on the shores with locals, while others, like Jennifer Lopez, prefer to stay at luxury hotels. She recently celebrated her 42nd birthday at the FontaineBleau. 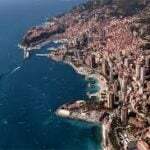 French Riviera has long been a gathering place for the rich and famous. Superstar couple Jay-Z and Beyonce have vacationed here for years, lolling on their private yacht, jet-skiing or hitting beach hotpot Club 55. However, the most buzz was generated by Brad Pitt and Angelina Jolie, who have purchased their villa outside Aix-en-Provence. It was reported that the couple flew by helicopter from estate to estate (landing in the backyard!) along the Riviera until they found the 32-bedroom Chateau Miraval. Notable neighbours include Bono and Jonny Depp. Wax your surfboard and make like Cameron Diaz by heading to Hawaii. The actress frequently visits this Western state, often in the company of friends. Hawaii: It’s not just for honeymoons. 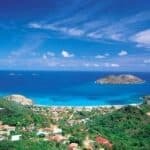 London-based couple Gwen Stefani and Gavin Rossdale and their kids, Kingston and Zuma, often decamp to this tropical paradise in the French West Indies for the holidays. There, the family takes boat rides, builds sandcastles and mingles with other star visitors, like Mariah Carey, Derek Jeter and Orlando Bloom. This Caribbean island includes 365 beaches, as well as rainforests and water sports such as river-rafting and windsurfing. Stars have flocked to Antigua’s shores since Madonna and Sean Penn honeymooned there in 1985. Today, Oprah Winfrey, Denzel Washington and Giorgio Armani own homes on Antigua. This island at the northern end of the Bay of Naples is known for its healing volcanic mud, thermal hot springs and exotic gardens—as well as its excellent wine and olives! 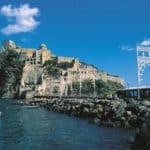 Ischia—nicknamed the “Green Island” for its lush vegetation—has a fan in actress Hilary Swank, who enjoys sunbathing on its beaches. We hope that you now feel quite inspired for celebrity-like vacations. And if not, then we have something more private for you: Top ten Europe’s Secret Beaches. Far away from the crowds! Hi! I just wish to give you a big thumbs up for the excellent info you’ve got here on this post. I am returning to your site for more soon. Feel free to surf to my webpage … is apple vacations a good choice?